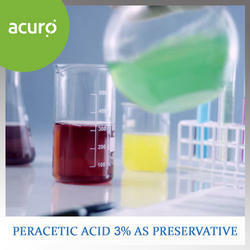 Peracetic acid 4%, because of its high Hydrogen Peroxide : Peracetic Acid ratio, is used in applications requiring preservative action such as industrial water circuits. It also finds use in the food and beverage industries. 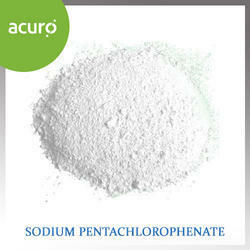 Sodium pentachlorophenate is a white or tan, powdered solid. It is soluble in water and may burn, but it is not easily ignited. It may be toxic by ingestion, inhalation and skin absorption. It is used as a fungicide, herbicide and as a disinfectant. 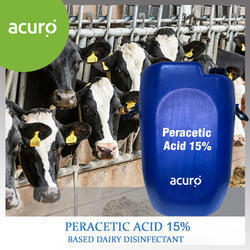 ACURO's Peracetic Acid 15% is a rapidly acting oxidising biocide and as such offers our customers an alternative to traditional disinfectants such as UV and hypochlorite treatments. ACURO offers a range of peracetic acid based disinfectants formulated for the control of harmful microorganisms in raw sewage and sewage effluent. It is an equilibrium mixture of peracetic acid, hydrogen peroxide, acetic acid and water. In surface water peracetic acid will be hydrolysed. The degradation products formed by hydrolysis are acetic acid and hydrogen peroxide, both of which are easily biodegradable substances. 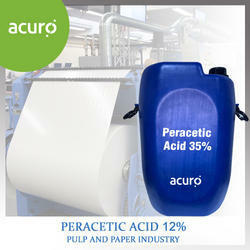 ACURO offers 12% peracetic acid formulation specifically developed to disinfect white water systems of paper machines to prevent microbial contamination of fibrous material in the circulation water.In the pulp and paper industry there is a need to disinfect white water systems of paper machines to prevent microbial contamination of fibrous material in the circulation water. If not controlled this microbial contamination can lead to the formation of inorganic/microbial and pure microbial slime deposits. These deposits can cause critical failures in papermaking and reductions in the quality of paper resulting in costly losses to the paper manufacturer. Slime formation in paper machines has long been a cause of concern to paper manufacturers and has led to the use of slime control agents in paper manufacture. These slime control agents have changed over the years from mercuric compounds through halogen compounds to today’s organic microbiocides. Peracetic Acid 12% (PAA) has been proved to be extremely effective at removing these deposits this mainly being due to its existence as an equilibrium mixture of peracetic acid, hydrogen peroxide, acetic acid and water. The hydrogen peroxide present reacts within the polysaccharide layer of the biofilm causing it to disrupt allowing the peracetic acid present to destroy the micro-organisms. This synergistic effect in removing biofilm has been exploited in the paper industry, where Peracetic acid is widely used as a slimicide. Most organic chemists know m-Chloro-peroxybenzoic acid as a versatile oxidant for selective oxidations from the laboratory. However, this reagent is expensive and too difficult to handle to be used on an industrial scale. An alternative oxidizing agent with similar reactivity that is suitable for industrial purposes is peracetic acid. For various numbers of oxidations also hydrogen peroxide can be used. 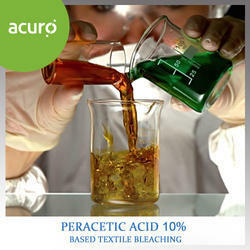 ACURO offers high strength equilibrium peracetic acid, which are the products of choice for chemical synthesis. The breeding and rearing of livestock is essential to meet world requirements for food. Disinfectants are extensively used to control and minimize diseases affecting animals. Peracetic Acid offers our customers one of the best active ingredients to replace traditional disinfectants. It is a formulated equilibrium mixture of peracetic acid, hydrogen peroxide, acetic acid, water and surfactant, allowing superior wetting of sprayed surfaces. Peracetic Acid can be used for a variety of applications ranging from routine animal house disinfection to use in foot / boot baths. It is suitable for use under cold conditions and can be used for flushing, soaking, pressure washing and fogging. 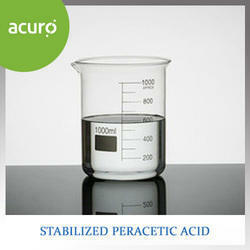 Peracetic Acid 5% is a stabilised, equilibrium mixture of peracetic acid, water, acetic acid and hydrogen peroxide. Peracetic acid is one of the most powerful microbiocides available and is active against a wide spectrum of micro-organisms including aerobic and anaerobic bacteria, bacterial spores, moulds, yeasts other fungi, their spores and also algae. Fast actingNon-foamingNon-taintingNon polluting to the environmentNo need to rinse after useStore in cool conditions, away from direct sunlightKeep containers sealed when not in useStore away from incompatible materialsIt is also used in circulation cleaning and institutional/industrial sanitizing of pre-cleaned, hard, non-porous food contact surfaces and equipment such as tanks, pipelines, evaporators, fillers, pasteurizer and aseptic equipment. For the chemothermal disinfection of laundry products, Peracetic Acid is used in the washing step as a disinfectant and bleaching agent. The high H2O2 concentration in Peracetic Acid provides the desired bleaching effect. The favourable ratio of peracetic acid to H2O2 has a positive effect on the stability of the peracetic acid in the washing , and in some cases makes it possible to reduce the quantity of disinfectant added while retaining the same good bleaching effect. 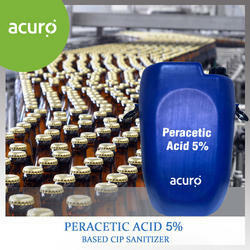 ACURO ORGANICS LIMITED stabilized Peracetic Acid is a liquid sanitizer for the food and beverage industry. Its no-rinse, non-foaming formula and its ability to sanitize at cold temperatures makes it ideally suited for use in circulation (CIP) clean-in-place systems for food processing equipment. Peroxyacetic acid liquid sanitizer is also approved for immersion cleaning of equipment and utensils for food processing and packaging plants and eating establishments. PAA is used at low solution concentration to rapidly kill a broad spectrum of microorganisms including gram-positive and gram-negative bacteria. It is more tolerant than most sanitizers to pH, temperature, water hardness and organic soils. The decomposition products of PAA solutions are acetic acid, oxygen and water, which do not harm or pollute the environment. In summary, Peracetic Acid liquid sanitizer is highly effective economical to use and environmentally acceptable. 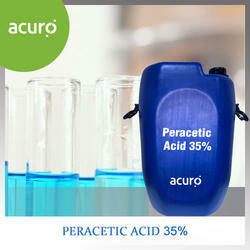 Looking for Peracetic Acid ?